Many scuba divers find themselves awed and inspired by the colorful array of diverse sea life they experience underwater and decide to take up underwater photography to capture the majesty of their diving experiences. To begin photographing your diving experiences, you will need specialized underwater camera equipment with flashes and casings. andbull; Point and shoot cameras andndash; These easy-to-use, compact cameras are the least costly and are designed for the casual photographer. andbull; Digital SLR cameras andndash; Digital Single Lens Reflex cameras come with multiple lens and accessory options and are designed for serious photographers. However, they are also the most costly. andbull; Full-featured cameras andndash; These intermediate cameras offer features of both digital SLR and point and shoot cameras. They are relatively compact and easy to use, but they also come with many of the same features of a digital SLR camera. 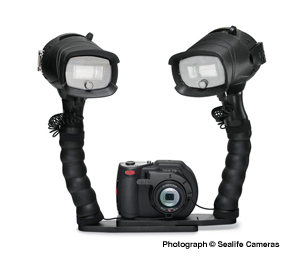 All three types of cameras can be used underwater with an underwater housing. An underwater housing is necessary for a camera to be able to withstand full underwater submersion, protecting it from the water and increased pressure. A local Key West dive shop can answer all of your underwater housing questions and help you select the best camera and housing to turn you into a professional underwater photographer in no time at all. andbull; Manual white balance andndash; White balance allows your camera to measure and adjust the surrounding light color to produce the best color possible. Although digital cameras automatically do this, it may be difficult for it to find a good setting while underwater, so the ability to set the white balance yourself will allow you to produce much more vibrant pictures. andbull; External flash andndash; Most cameras may come with a built in flash, but having a separate flash can be very helpful while taking pictures underwater, providing you with more light from better angles. andbull; Wide angle adapter andndash; For full-feature and point and shoot cameras, housing that provides you with the ability to use a wide angle lens will be a definite advantage. andbull; Full control access andndash; Some housings allow you to use more controls than others, and more controls will give you much more shooting options. andbull; Large memory card andndash; A memory card should be large enough to allow you to take as many pictures as you want during a single dive. When shopping for underwater photography equipment, you should purchase the camera, housing, and all of the other accessories together. It’s important to note that housings are not available for all cameras, especially older models. If you decide to get a high end digital SLR camera, you should consider all of the lenses and other accessories that are available, because you will want to invest in other lenses over time. The underwater photography professional at your local Key West dive shop will be able to answer any questions, explain your options, and help you choose underwater camera equipment that will provide you with years of diving adventures and memories.